Restore Session in Firefox 3.5 with selection option. Session Restore is from the version 3.0 but in this version a dialog box used to come in case we can just choose whether we want to restore the session or start a new session as given in image below. Just click on “Restore Session” to recover the pages we were visiting before closing of FF else click on “Start New Session” to have a new session. 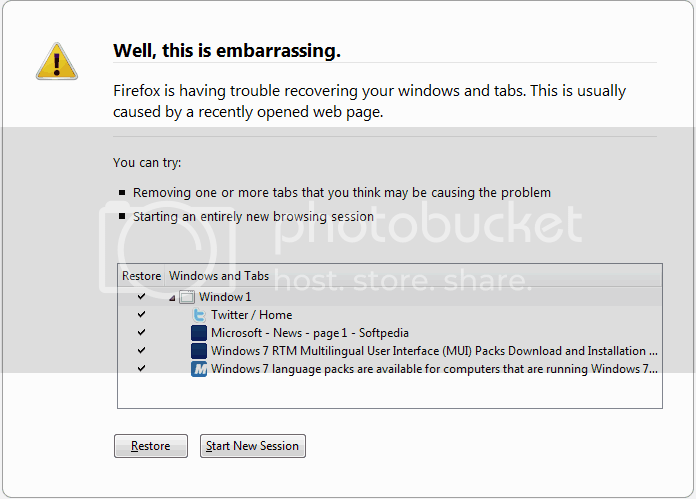 But in Firefox 3.5 there is an improvement in this feature, the Restore Session( i.e. “Well this is embrassing”) page appears. Here we have freedom of choosing the Windows or tabs which we want t restore by cheking or uncheking the checkbox infront of them. Firefox 3.5 with the ability of this selective Restore Session is very helpful for users and developers in case of unexpected closing of Firefox. We may came accross such ituation incase of Software crash, After installation of any Add-on, or After a software update. Now from here we can select the particular tabs or Windows which are needed to be restored and then simply click on Restore button else simply click on “Start New Session” for starting a new session by discarding the recovering of pages.